During our honeymoon, it rained almost every day. It wasn't a single rainstorm as often happens on Florida summer afternoons but rather torrential tropical storms every day, all day and the winds so powerful that at one point Disney had to stop the monorails while we were on it. We waited, swaying on the track somewhere between The Magic Kingdom and The Contemporary Resort. While we ventured out into the parks during the day with our rain gear, at night after dinner, we'd head back to our hotel, (Disney's Polynesian Resort) to dry off. Then, we'd walk over to the game room, and stack up our quarters on the air hockey table. On our honeymoon, we played air hockey every single night. And that is how we discovered that as a couple, we really like games. While we both love videogaming, sometimes going old school is what the moment calls for. Several years ago when L was in Germany, he discovered Qwirkle, a strategic, tile-based game for ages 6+ that is similar to Scrabble but with colors instead of letters. We love playing this table game, especially on rainy days. 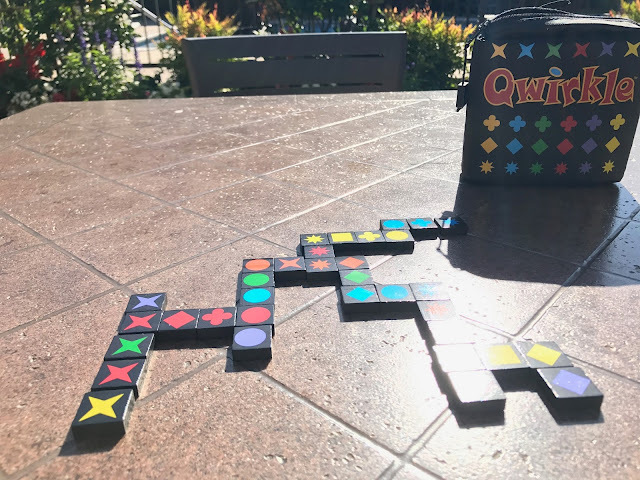 Recently, I discovered Travel Qwirkle and it's been fun having it here with me while I've been on the road. Yesterday, I made some new friends by the hotel pool and we sipped lemonade while played Qwirkle. (BTW, the tiles, while not meant to be submerged, did fine when splashed by pool water). It's an easy game to learn and good for 2-4 players. Learn more about Qwirkle here.